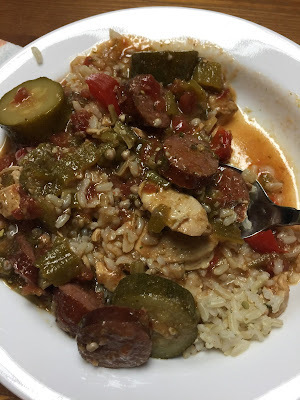 I call this recipe easy, because the only thing I really ever need to buy for it is kielbasa and okra, because I usually have all the other ingredients in my cabinets, fridge, or freezer at all times. It's also easy, because I have left out ingredients altogether, like zucchini or worcestershire sauce. I have also swapped out fresh flavorings for powdered ones, onion powder in place of chopped onion, for example, and it always tastes great no matter. Chop your meats into bite sized pieces and throw them in the warm-hot oil. Let them begin to cook and begin to brown, stirring them fairly constantly, and adding more olive oil to keep the meat from burning. With gumbo, brown and sizzling is good. Black and dry and bad. Add oil to avoid any dryness or burning. Once the meat is browned all over and the fats are rendering out of the sausage, push all the meat over to one side of the pan. In the open space at the bottom of the pan, add approx. one quarter cup of water. This water will steam a little, it will mix with all the oils and fats on the bottom of the pan, and it will begin to bubble up, because your pan is pretty hot at this point. Quickly sprinkle in a few tablespoons of Worcestershire sauce and about two tablespoons of corn flour and mix it around in the open space on the side of the pan. Let that "gravy" cook for a few moments. Other people are probably much more careful about their roux. I am lazy, and I like easy, so I don't even take the meat out of the pot. It still tastes great in the end. Next add your tomatoes with juice and then add your spices or your spices and then your tomatoes. I don't really measure and I don't think you should measure either. Just be generous with everything. Sprinkle, sprinkle, sprinkle and then mix it all together and give it a little taste. If you are using fresh parsley, you would use less, because fresh spices are more potent and can be overdone. But if you are using dry spices, you can add a lot more and I usually do. Remember gumbo is supposed to be savory and thick with flavor. Make sure to add enough salt. Like the oil at the beginning, you want to use enough. For it to be a true gumbo, don't skimp. Next add your vegetables and remaining broth or water. Turn the heat up a bit, until it begins to boil, then turn it down and let everything simmer until your chicken and zucchini are fairly soft. I like to make this in the late afternoon when I still feel like cooking and, once it is done, turn off the heat and let it sit on the back of the stove until a few minutes before dinner, when I heat it up to a temperature that is just right. The time spent sitting on the stove is not critical, but it definitely gives the flavors a chance to mix. If I plan to let it sit, I will stop cooking the gumbo just until the chicken is cooked through and then trust the hour spent hot on the stovetop to cook everything the rest of the way. I serve this over brown rice that I also make ahead in the rice maker and let sit and warm until we are ready to eat.